crazy heart. – static confusion. i aspire to be a writer. i suppose i am a writer. i am committed to sharing stories; telling stories. literary vulnerability from my brain to your eyes. to read. to digest. to digress. it seems though that through my own reading — and research — i often come across a poet or a writer who has already written the words i am thinking. who has already conveyed the emotions that i am feeling. r. m. drake is that vocabulary white knight of late it seems. the girl he writes of is right here in first sight. a caged spirit waiting to be free; waiting for her love to relinquish thee. wild as a mustang, calm as a bird; her heart conflicted and knotted tightly in her chest. 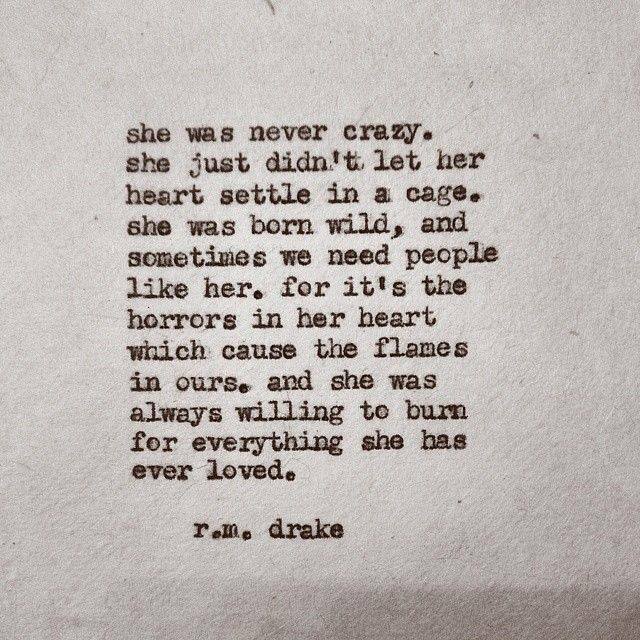 yet she braves the flames, she fights to get free. she may be be the one that flies over the cuckoos nest but he is the one that put her crazy heart to rest. now out in the world, escaped from everything she ever loved, she understands why the caged bird sings for he was calling for his lover, and she, well she no longer means a thing. Previous Post a diamond day. Next Post insanely courageous; beautifully brave.